Interlaken is centrally located in Switzerland’s Bernese Oberland as a popular vacation destination for many international visitors as well as Swiss citizens. The city lies on an alluvial plain between the crystal clear lakes of Thun and Brienz. Interlaken is presided by its three major mountains, which include the Eiger, Mönch and Jungfrau. 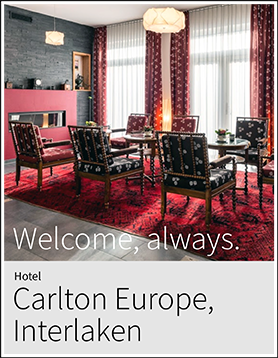 The city features various hotels and mountain excursions making it a gateway to the beautiful Jungfrau region. Our Interlaken vacation guide can help you get the most out of your visit to this world class destination. The city’s surrounding mountains present visitors with plenty of year round attractions and activities. The Jungfrau region’s mountain railways have allowed many Interlaken visitors to create memorable experiences. Interlaken’s popularity has been on the rise ever since the completion of railways such as the Bernese Oberland Railway in 1890. Today Interlaken’s visitors have access to over 45 mountain railways, cable cars, chair and ski lifts. The Jungfraujoch, Mt. Schilthorn and Schynige Platte all offer amazing mountain top experiences as they are in close proximity to Interlaken. From Interlaken travelers can easily explore the beauty of the Bernese Oberland whether it is by the water, mountains or scenic train route. Interlaken serves as an ideal starting point for to achieve an endless amount of excursions and unforgettable experiences. Travel to Europe’s highest station located at the Jungfraujoch with an altitude of 3454 m/11,332 ft. The Jungfrau railway has pleased its visitors for more than 100 years of operation and adventure. The railway journey consists of a 7 km/4 mi tunnel passage and marvelous views of the Eiger North Face. 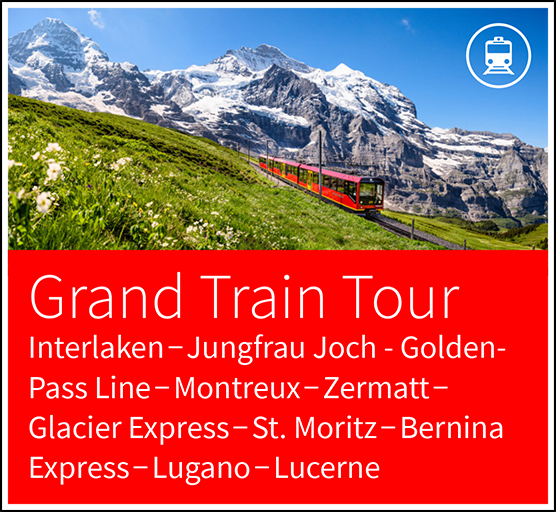 The Jungfraujoch experience begins by taking a 40 minutes train ride to Kleine Scheidegg from Interlaken. The Schilthorn is another wonder of the Bernese Oberland with its magnificent 360° panoramic views and elevation of 2970 m/9744 ft. The Schilthorn can be reached from Interlaken in 2 hours via train and bus. At the summit enjoy a delicious meal in the revolving restaurant of Piz Gloria with views of Mount Eiger, Mönch, and Jungfrau. The summit features a revolving restaurant titled Piz Gloria as well as an interactive James Bond exhibition. Visit the Niederhorn from Interlaken with a scenic rides aboard a Lake Thun cruise ship, funicular train and aerial cableway to the mountain’s elevation of 1963 m/6440 ft. This popular Bernese Oberland vantage point offers spectacular views over Lake Thun, the Aare Valley, Brienz ridge, Eiger, Mönch and Jungfrau. This mountain excursion also offers sightings of an Ibex colony, a sun terrace restaurant and Beatenberg scooter rides. The Schynige Platte mountain station is located at the heart of the Jungfrau region at an elevation of 2076 m/6811 ft. A ride aboard the historic cog railway entails a truly nostalgic experience with its wooden benches and 19th century vintage rolling stock. This excursion begins with a railway trip from Interlaken Ost to Wilderswil, where a cog railway will bring visitors to Schynige Platte. Harder Kulm is Interlaken’s local mountain making it easily accessible for guests to visit its summit at elevation of 1322 m/4337 ft in just ten minutes. The panoramic funicular train departs near the Interlaken Ost station leading passengers through a charming forests and wildlife park. In addition to a restaurant, the summit also features a glass platform for visitors to feel afloat while gaining deep sights and views of the Eiger, Mönch and Jungfrau. The Heimwehflue’s valley station is a short walk from Interlaken West and still uses technology from 1906 to bring visitors up to an elevation of 669 m/2195 ft. The Heimwehflue’s vintage funicular climbs the hilltop exposing passengers to views of Interlaken and Lake Thun. Additional attractions include a toboggan run and model railway exhibition. The station’s central location to Interlaken makes it an ideal half-day excursion. The Swiss Capital of Berne is less than an hour away from Interlaken. It has a beautiful Old Town including of medieval magic, and is listed by UNESCO as a World Cultural Heritage. Attractions include shopping under arcades, the famous clock tower and the new bear park which is home to Berne's heraldic animals. Lucerne is probably Switzerland’s most popular destinations and is reachable via Golden Pass scenic train in just under 2 hours. Famous for being wedged in between mountains and lakes, it includes a beautiful Old Town and the Chapel Bridge. Visitors can take also take a cruise on Lake Lucerne and will find excellent shopping possibilities. 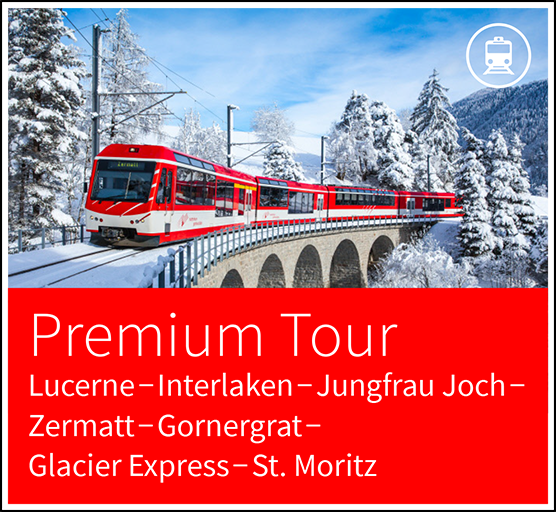 As a popular full day excursion from Interlaken, visit the typical mountain village of Zermatt elevated at 1620 m/5310 ft. From Brig, the route runs along the sunny southern flank of the Lötschberg Mountain and provides a great first impression of the Valais. The route to Zermatt staggers through the beautiful valley landscape and eventually leads to the Matterhorn Mountain. 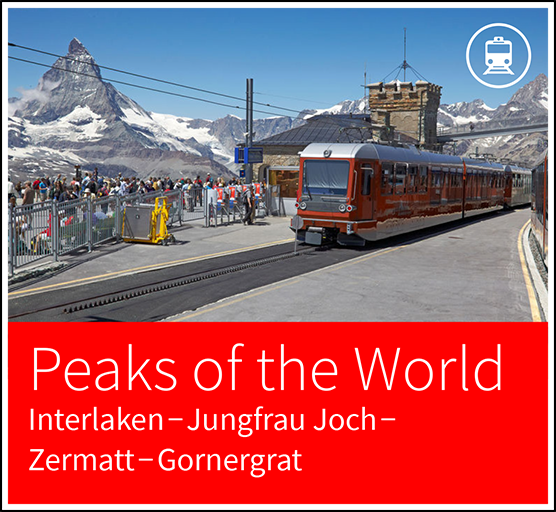 Extend this excursion by taking a cogwheel railway up to the 3089 m/10134 ft. Gornergrat peak. Montreux is located on Lake Geneva and is 1 hour and 30 minutes west of Interlaken via train. This excursion is exceptionally unique in that travellers cross a border between the German and French speaking parts of Switzerland. The journey to Montreux runs along Lake Thun and via Zweisimmen and Gstaad, bringing passengers to the shores of Lake Geneva. 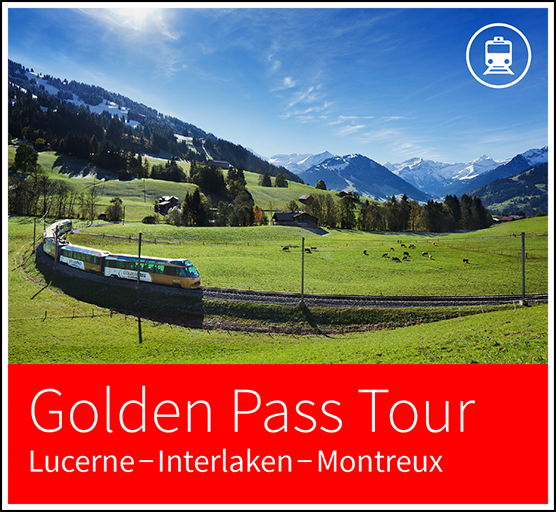 The Golden Pass Line is panoramic train route that spans from the shores of Lake Lucerne to the vineyards of Lake Geneva. The train stops in Interlaken between Lucerne and Zweisimmen. The entire route spans 191 km/118 mi travelling from Western to Central Switzerland in about 5 hours. Interlaken visitors can embark on this journey to enjoy another Swiss region on a comfortable and scenic train ride. The St. Beauts caves’ subterranean waterfalls, stalagmite and stalagmite formations are a spectacular sight that can be explored 1000 m/3280 ft in depth. These caves are located on Lake Thun, just 11 minutes from Interlaken via train. Visit Switzerland’s first and only underground cave museum as a half or even full day excursion. The Bernese Oberland Navigation has a fleet of 12 cruise boats and 2 paddle steamers that navigate either Lake Brienz or Thun year round. The cruises depart from Interlaken Ost and West offering guests with a unique perspective of the Bernese Oberland on the water. Enjoy a leisurely cruise during the day or evening with entertainment and beautiful views. 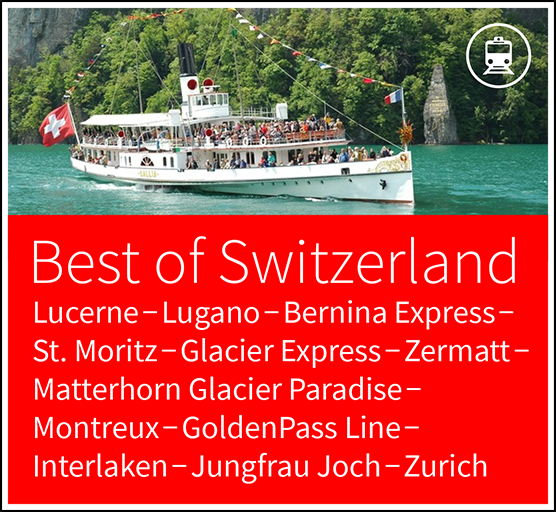 Our Interlaken vacation guides can help you make the most of your trip to Switzerland. Call us today at 1-800-33-SWISS or visit our Switzerland trip planner to plan your custom vacation. Interlaken and its surrounding area features over 500 km/310 mi of marked footpaths for hikers to explore. There is an extensive network of hiking routes on Mt. Niederhorn, which also serves as a habitat for ibexes, chamois and marmots. Visit Interlaken’s local tourist office for more detailed hiking maps and suggestions. Biking can be done almost anywhere in Switzerland however is exceptionally beautiful in and around Interlaken. The city of Interlaken and its streets are very accessible by bike. Visitors can rent either a 7-gear country bike or 21-gear mountain bike depending on desired routes. The Lütschine River is located in Interlaken and has a rapid current making it one of Switzerland’s best rafting experience. This alpine river originates from the Eiger, Mönch and Jungfrau glaciers. Interlaken offers an endless amount of summer sports with its excellent location and facilities. A few additional summer sports available in Interlaken include bungee jumping, canoeing, ice climbing, glacier hiking, sailing, skydiving and much more. Interlaken’s central location in the Jungfrau ski region is highly beneficial to its winter visitors and offers 200 km/124 mi of slopes. Mürren—Schilthorn, Kleine Scheidegg—Männlichen and Grindelwald—First are Interlaken’s top three ski locations. Daily ski bus transfers connect Interlaken visitors to these ski regions and their 45 mountain lifts. Interlaken visitors interested in cross-country skiing or tobogganing also have plenty of options to do so in the area. There is a total of 220 km/137 mi of winter walking paths available in Interlaken, Beatenberg, Axalp-Brienz, Habkern and Wilderswil. Interlaken’s Casino Kursaal is a unique complex with spacious rooms, elegant gardens, restaurant, inviting hospitality and atmosphere. The Casino’s gaming offer includes American roulette, blackjack, poker and slot machines. Interlaken’s guests are invited to enjoy a night of leisure and fun at the Casino Kursaal. As the Bernese Oberland’s central city, Interlaken has numerous good quality stores that vend everything from souvenirs to locally made Swiss watches. Höheweg is Interlaken’s main street on which visitors can browse for hand made crafts and sports equipment. Another good shopping area is around Interlaken’s West train station. Interlaken’s Tourism Museum presents the historical development of the Jungfrau’s regions tourism and is located in the city’s Untersee old town. The museum explains a 250-year-old story of alpine tourism through a traveller’s perspective and experiences. This regional museum invites visitors on an exciting journey to better understand alpine tourism and its role in Interlaken’s development. Interlaken’s visitors can reach the Open-Air Museum Ballenberg in 1 hour via car or train. This open-air museum is 66 hectares of traditional Swiss chalets, partly wooded paths and cares for 250 different farm animals. The Museum Ballenberg and its interactive area is an ideal experience for Interlaken’s visitors to uncover the origins of the Swiss lifestyle. The Swiss Federal Railway Foundation presents its historical models of transportation and trains. This museum visit is ideal for Interlaken’s visitors interested in Swiss engineering and train models. The exhibition illustrates more than 150 years of Swiss railway history with many laid out tracks and miniature landscapes. This attraction is located near the Interlaken West train station. Interlaken is located in Central Switzerland, close to other major Swiss cities including Zürich, Geneva, and Berne. Interlaken’s nearest airport is 122 km/76 mi away located in Zürich with a travel duration of about 2 hours via car or train. Interlaken is 217 km/135 mi east of Geneva and 56 km/35 mi south of Bern. When visiting this city travelers can take international train connections to Interlaken Ost. Our Interlaken vacation guides can help you plan your trip to this beautiful city. Call us today at 1-800-33-SWISS! Contact our Interlaken, Switzerland Vacation Guides today by visiting our Switzerland Trip Planner!